Dustin and Diana Stirling celebrate the successful placement of North America's largest santa hat on the beach by the beach Thursday afternoon. Diana Stirling and friends unofficially claim title of North America’s largest Santa cap. If the hat doesn’t fit….fix it. 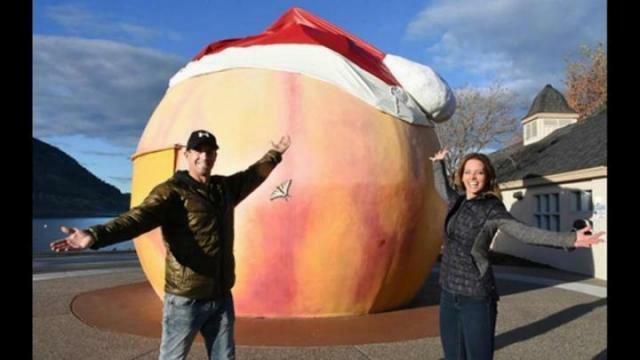 That’s exactly what Diana Stirling and friends did Thursday in the case of North America’s largest Santa cap which now adorns Penticton’s iconic (and very festive) waterfront Peach on the Beach. The impromptu alternations added roughly another eight feet of material to the large hat making it 64.5 feet wide, complete with a 12.5-foot pom pom. All this to the delight of passersby who stopped to admire the unique feature after the crowning was completed just after noon. Work began just after 7 a.m. and 40 minutes later the large forklift generously donated by Greyback Construction, which had been working just down the street, began the process of lowering the hat on the peach. The hat is constructed mainly of vinyl and was handmade by Dustin and Gerry Denis, owner of Sun-oka Boat Tops in Summerland. The entire process took several months in the planning and creation, but is not the first time the Stirlings have dressed up the giant peach since buying it earlier this year. “We tested it with making the peach a big jack-o-lantern on halloween and the community loved it so we thought we would surprise Penticton,” said Diana. “While it’s only open for business for 90 days, we want people to have fun with it all year round. Why not make it a jack-o-lantern or throw a massive santa hat on top of it.